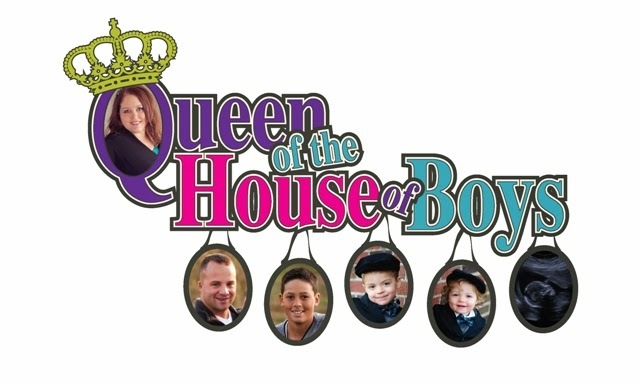 Queen of the House of Boys: From 5 to 55! Woah! I remember when I was excited to have 5 followers...now I have 55! That is exciting! I love connecting with new people! I love hearing and seeing how other people live! Since I do have several new people following my blog now...I just wanted to take a minute to remind you all that I also have another website! My mother & I started J&J Inspirations back in June. We make fancy aprons and custom creations. My mother has been sewing since her early teen years, and her seamstress skills are top notch! The detailing she puts into her sewing is brilliant. I, on the other hand, haven't totally received the golden sewing touch..but I HAVE received the shopping and designing touch. I love looking for and buying new fabrics. I LOVE the smell of a fabric store! So I do the buying and matching up of fabrics and assigning what design to what fabric...and my mama does the sewing, which to me is the biggest job of all! While we do have several aprons on our website, we have even more listed on our Facebook page. And last but not least...we do custom orders! See a design you like but would prefer in a different fabric?? We can create something custom just for you! Aprons make the most wonderful gift! Whether its Christmas, birthday, Valentine's day...anything! We make women's, mens, and childrens aprons. Men LOVE to wear our aprons tailgating or hosting their barbeque's. Children love to dress up like mom and dad...we can make matching aprons for the little ones! We are certified through Paypal! Why did we start the business? Because after being home for a while, you start looking for something more. Something out of the every day ordinary. Something that makes you feel like you are using your creative intelligence for something more than laundry and family meals. We love to create things, and nothing beats seeing the look on a customers face who has just fallen in love with something you have put your heart and soul into! Thank you for joining my blog. Thank you for following our handmade business! We appreciate each and every one of you! I am really enjoying your blog! I gave you a blog award, check out my blog for details! Have a great weekend!